Understand foundational strengths philosophy; educate clients on strengths philosophy. Practice key strengths-based coaching strategies: support clients in understanding their strengths and how to use them to produce results and reach their goals. Learn strategies for managing client weaknesses; teach clients to self-support. Speak confidently to and coach effectively around the 9 StandOut strength Roles and combinations for individual and teams. 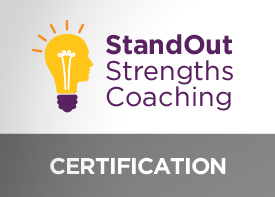 Integrate their own StandOut Roles and strengths to become an even more effective coach. Leverage the StandOut Platform to support coaching conversations.